'Tis the season...to host parties! It's one of my favorite things about the holidays. I love attending parties (who doesn't enjoy an excuse to put on a cute holiday outfit?! ), but I take supreme joy in hosting parties. Planning the menu, adding holiday flair around the home, creating a music playlist and, above all, a solid reason to clean my house. Some people need more motivation than others. Don't judge me. For as amazingly fun it is to host a holiday gathering, it's equally as stressful. I love finding the recipes, but the pressure is on day-of to get everything whipped up in time. Planning an outdoor lighting scheme with Hubby is fun...until you find the lights don't reach as far as you need them to or one of the strands is burned out. And it's absolutely motivating to enjoy a clean and tidy home. But the sweat and tears it takes to get there can be daunting. I don't know about you, but I always come to a party hungry. And while you may have a fantastic main course prepared, appetizers and snack foods cannot be overlooked. The CVS Gold Emblem food line has everything from mixed nuts and crackers to scoop up dip to cookies and truffles. Salty and sweet is the perfect mix for a festive fete! Sometimes the small things are the easiest to forget. And there is nothing more embarrassing than running out of toilet paper in the middle of the party. Make sure bathrooms are stocked with Total Home Toilet Paper and Skin Wipes! Don't get caught up in making sure you have enough plates to go around. And being stuck at the sink cleaning is not a fun task to look forward to. 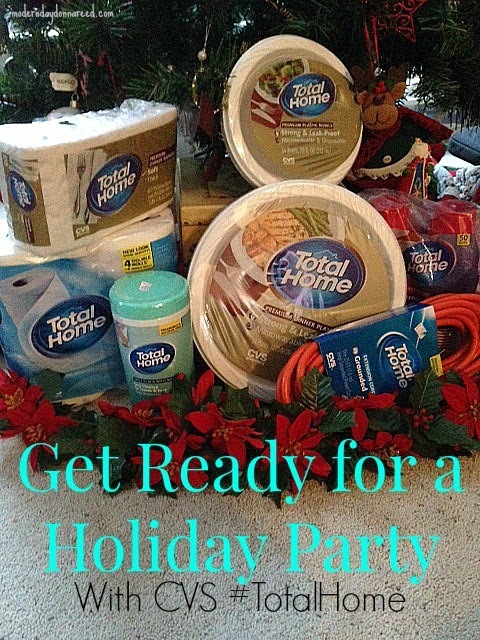 Keep serving easy with the Total Home disposable products. They have a full line of plates, napkins, cups, and utensils that are durable and neutral (white goes with everything! ), which makes serving a breeze. Parties are the best motivator to clean up. Even if you don't have time for a deep clean, Total Home cleaning products make a quick tidy of the house a cinch. I love how versatile the Multi-Surface Wipes are (they literally can clean all the surfaces in your home before the guests arrive)! It's time to make Clark Griswold proud. Plan those elaborate lighting patterns. CVS Total Home extension cords will make sure to illuminate even the most intricate of designs, both inside and out. Get the scoop on the CVS Gold Emblem and Total Home lines at www.cvs.com. What are YOUR Party Readiness Tips?